Motherhood can be messy. Frightening. Demoralizing. Stressful. Challenging. Complicated. Sometimes you wonder (or maybe it’s just me? ), how can you love someone soooo much and yet at the same time, find yourself screaming like a totally irrational tot at her (the actual tot) … only to cry after she’s asleep because you realize that showing your true colors to a 3-year-old is as useless as wearing snow pants in July and really, at the heart of it, you were just PMSing and “fwus-ta-wated” [frustrated in toddler-speak] at the pile of dishes in the sink from the night before that neither of you could get to, the work project still on hold for the third day in a row with the unmoving deadline, the jeans that aren’t fitting as well as you’d like (because you’ve been avoiding the gym like the plague) … and she just happened to push your buttons on a day when you were already late for a morning meeting. You snapped. And it isn’t right … but it happens. Yea. Sometimes motherhood is really, really hard. But for as tough as it can be, it is also the most amazing thing I have experienced. And it’s the beautiful moments that make the tough ones, the seemingly impossible ones — where you’re pulled in fifteen directions — seem possible. It’s the nights-that-become-mornings with a newborn baby draped over your shoulder, fast asleep, whose lips open and close, rooting for milk. It’s the skinned knees that symbolize fun and fearlessness, and which only a mama’s kiss (and a Hello Kitty Band-Aid) can cure. It’s the Saturday afternoons spent in jammies til noon and perfecting the art of bike-riding til dusk. It’s a sick day at home with Mommy, where the snuggles are free and generous and the chicken noodle soup flows freely. And it’s fleeting. That’s the thing about motherhood — it changes by the day. I’ve been savoring every rocking session with Ben because he’s (likely) our last baby and he’s getting to the point where he wants to be a boy on the move — squirming his way out of my arms. But at bed-time, when he’s silent and still and breathing into my shoulder … it’s heaven on earth. And when Maya comes up to me and wraps her arms around me for no good reason, asking me a thousand questions in that inquisitive little sweet voice … I melt. 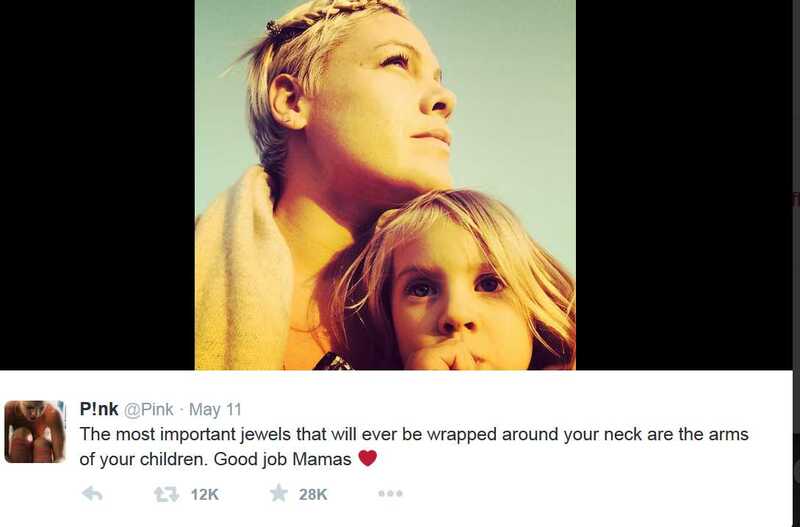 I’ve been a bit obsessed lately with Pink, and came across this incredibly powerful tweet from Mother’s Day that she posted. The most important jewels that will ever be wrapped around your neck are the arms of your children. I have never read truer words. Those little arms, with their chubby rolls … and those knuckle-less mitten hands … when embracing me … they could stop the world from turning. There’s no amount of money that could replace that feeling; it’s beyond priceless. It’s beyond precious. It’s love, like none other. It’s the love of my husband, or my own parents, magnified. It’s an impossibly complicated and beautiful, enduring love. And so sometimes I yell … Sometimes I get angry or “fwus-ta-wated.” Sometimes I feel like a “bad Mommy.” And sometimes I just have to take a step back and see myself through my daughter’s eyes. When I do that, it forces me to pause and calm myself. She might know how to push my buttons (and she’s not even 4 yet … heaven help us) … but she also is the source of so much pride, joy and love that I could explode. Amazing how one little person can make you feel so much … and at once. Love your thoughts. I just love them! !